The Billy Joe Saunders-Shefat Isufi fight is official. 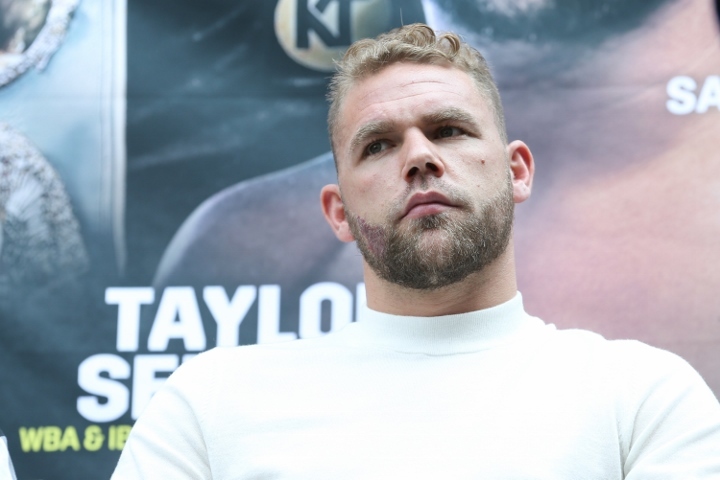 Promoter Frank Warren and broadcaster BT Sport announced Monday that Saunders and Isufi will fight for the WBO’s interim super middleweight title May 18. Their bout will take place at 6,700-seat Lamex Stadium, a soccer venue that’s home to Stevenage FC, in Hertfordshire, England, Saunders’ home county. The 29-year-old Saunders (27-0, 13 KOs) is the WBO’s No. 2-ranked contender at super middleweight. Isufi (27-3-2, 20 KOs) is rated No. 1 by the WBO among its 168-pound contenders, but the 29-year-old Serbian is completely unproven at the championship level. Gilberto Ramirez remains the WBO’s super middleweight champion. The 27-year-old Ramirez (39-0, 25 KOs) will box American Tommy Karpency (29-6-1, 18 KOs) in a 10-round light heavyweight bout April 12 at Staples Center in Los Angeles (ESPN). Thereafter, he’ll decide whether to remain at 175 pounds or return to super middleweight to defend his title, presumably against the Saunders-Isufi winner. Saunders, a skillful southpaw who represented England at the 2008 Summer Olympics, decided earlier this year to move up from 160 pounds to the super middleweight limit of 168. He weighed in at 178½ pounds for his last fight – a four-round stoppage of 41-year-old Charles Adamu (33-14, 26 KOs) on December 22 in Manchester, England. Two months earlier, the WBO stripped Saunders of its middleweight title because he failed a performance-enhancing drug test administered by the Voluntary Anti-Doping Association late in August. Saunders tested positive for oxilofrine, a banned stimulant, which caused the Massachusetts State Athletic Commission to deny Saunders’ license application for a fight against mandatory challenger Demetrius Andrade on October 20 in Boston. The WBO subsequently stripped Saunders of the middleweight title he had owned for nearly three years. The top-ranked Andrade (27-0, 17 KOs), of Providence, Rhode Island, instead out-pointed Namibia’s Walter Kautondokwa (17-1, 16 KOs) in their 12-rounder October 20 at TD Garden to win the championship that was taken from Saunders. The WBO later made Saunders the mandatory challenger for Andrade, but Saunders decided to move up to super middleweight. The Saunders-Isufi fight will be televised by BT Sport in the United Kingdom. ESPN+ will stream it live in the United States. I was hoping this meaningless charade had died a natural death. Silly hoe Saunders is the biggest fraud in boxing.